The A Line skirt pattern has featured a few times in Style Arc’s range. Put simply, an A Line skirt is narrow at the waist, skims the hips and is full at the hem – just like the letter “A”. The magic of an A Line skirt is that it flatters a number of body shapes. For those with fuller figures below, the A Line design, like an arrow, draws the eye’s attention upward and the flare towards the hem negates larger hips. For those with slimmer figures, the A Line skirt creates curves where they don’t exist! For those with larger bust measurements, the A Line shape provides more balance – the lines almost create an hourglass look. Magic! A Line skirts first made an appearance in modern fashion in the 1950s, with lines by designers Christian Dior and Yves Saint Laurent. Pre-dating these Paris fashions though was Audrey Heburn in the 1953 movie, A Roman Holiday. 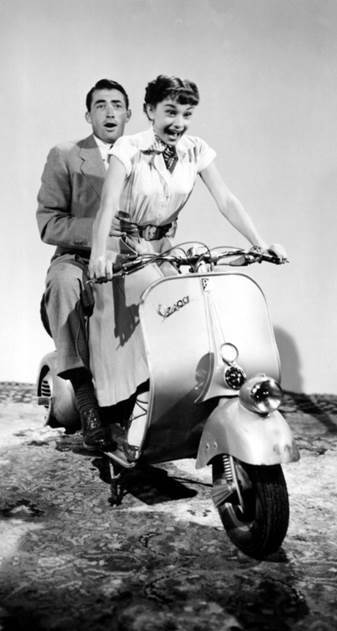 For some reason, it’s images of Hepburn flying around Rome on a scooter that comes to mind when I think of A Line skirts. The A Line skirt is back. It’s a hot 2013 trend! A Line skirts are not just a classic look of yesteryear. They’ve made a strong comeback recently. Now we’re seeing the classic look revisited by modern designers. It’s definitely a hot 2013 trend. We’ve seen plenty of trend reports in magazines and designer RTW garments featuring the classic A Line design. 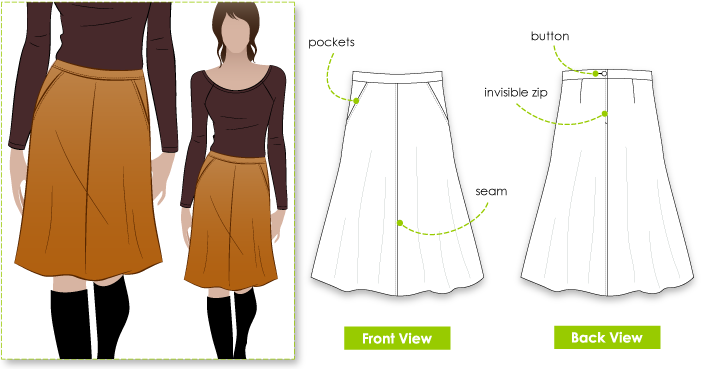 The Mary-Ann Skirt is a simple A Line skirt pattern. While the length and darts at the waist are features of a classic A Line, we’ve added angled pockets as well as front and rear seams to give the Mary-Ann a distinctive look. 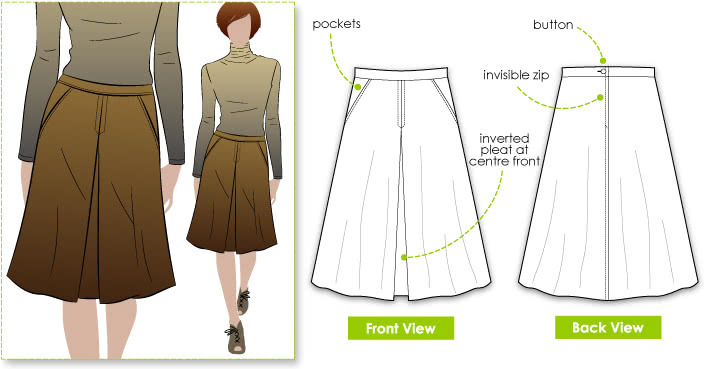 The Hepburn Riding Skirt is another basic A Line skirt pattern. It is very similar to the Mary-Ann skirt, but is differentiated by an inverted pleat feature on the front. The great thing about an A Line skirt sewing pattern is it’s usually so simple to work with. Even with an invisible zip you should be able to polish one off in an afternoon. Once you’ve made a basic version you can vary it according to your own personal style. We were originally thinking of a modern-day frontier riding skirt with the Hepburn Riding Skirt and the Mary-Ann. Fabrics like drill and gabardine came to mind. But why stop there? Different fabrics can allow you to transition between seasons and give a totally different look. 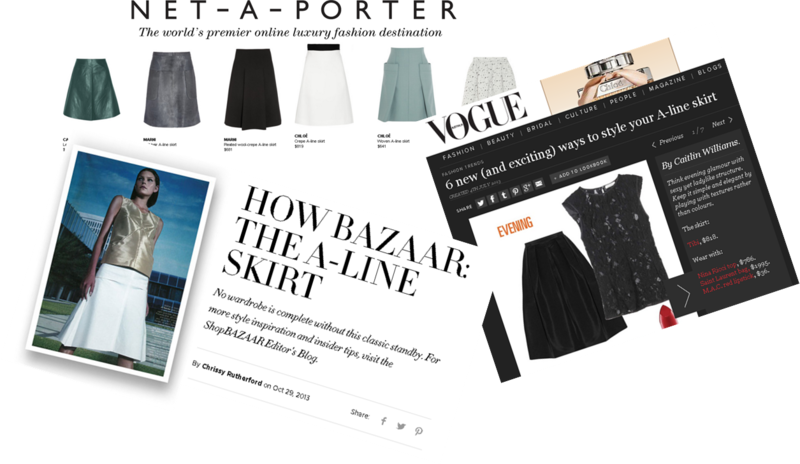 The A Line skirt pattern is so versatile! It’s such a worthy addition to your sewing experience.